You are currently browsing the tag archive for the ‘Top Down’ tag. 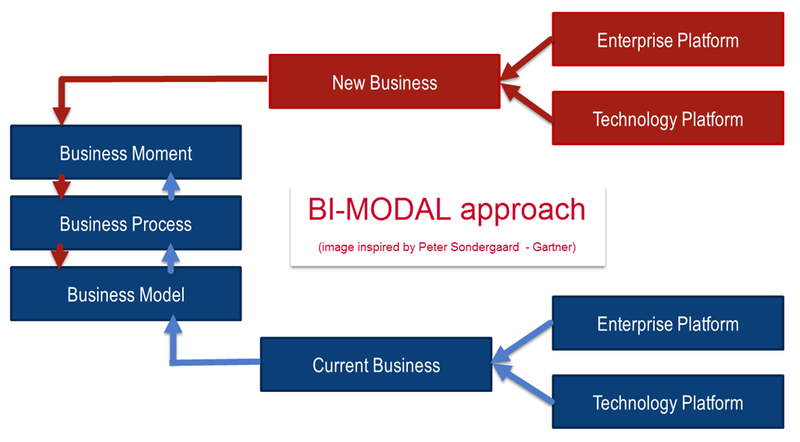 This week I realized that, although I believe the benefits of PLM are more and more accepted in mid-market companies, the decision how to start and where to start with PLM is often not clear. I recognize several approaches which I will describe in this and some upcoming posts. All persons in this post are fiction and in case you recognize these persons in your company, it is pure coincidence. Instead of talking about approaches,I was tempted to call it strategies, but when you read my observation you will realize the word strategy would not fit. 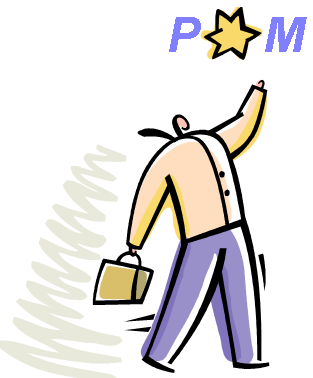 Inside our company, often there is an engineer or an engineering manager, who got caught by the PxM virus. The PxM virus is a modern virus, which makes you a believer that PDM or PLM will bring your company a lot of benefits. Documents and proof points of the severe impact exist all around the world. However nobody has gotten infected so far in this company. Everyone is working the way they worked since many years and life is secure and predictable. Now this infected engineer is getting exited and dreams about the introduction of PLM in his company and how he will become the hero of the company and gets a big promotion. Unfortunate for him in this kind of business there are no big bonuses to collect, so the honor of promotion is already a big achievement. So the first thing this engineer does is chatting with his peers and friends to find out where PxM has been implemented successful and he studies some success stories which he learned from his network. He goes to the management and shows a nice PowerPoint, explaining why the company needs PxM and what are the expected benefits, based on reference stories. The management has no real clue what he is talking about, but it looks promising and they allow him to select a PxM system for his department and to start a pilot. The engineer already knows which PxM system to choose. The one, recommended by the friendly reseller, who sold them their 3D CAD system (which is a success) and worked hard with him to finalize the slides. 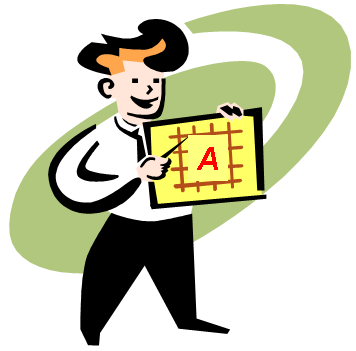 As requested by the management he had to invite two other PxM vendors to make an objective selection and at the end an impressive comparison matrix is shown to the management why system A has been chosen. Now the implementation starts and step 1 is very successful. The document management part around the CAD system goes smoothly and everyone in the engineering department starts to be happy. the engineer does not get promoted and the implementation ends. It will remain a silent document management implementation and the dream is put aside. the engineer gets promoted and continues to push his vision as now he has a broader audience to spread the PxM virus. We will follow this story line……. This is the best that can happen and the engineer, who now became the head of engineering, starts to express his vision to his fellow managers, explaining the advantages of PLM. Notice, he is now talking about PLM as the scope has been extended beyond product data management, involving other disciplines in the organization. And here the head of engineering discovers that his fellow managers are also infected by a virus. 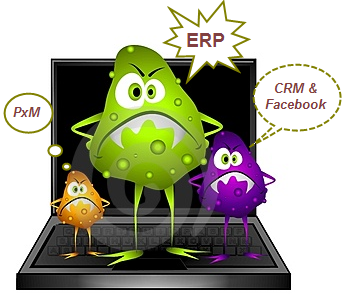 Not the PxM virus, but one of them has already for many years the ERP virus. And as the ERP virus addresses the operational and financial tasks in the organization, the management trusts him. The sales and marketing department seems to be infected by CRM, but currently they caught a social disease, which made them push for all kind of communities. The management either likes it (as their kids are also on Facebook) or dislikes it, because they believe work is a serious business and being on internet all day is considered gaming. 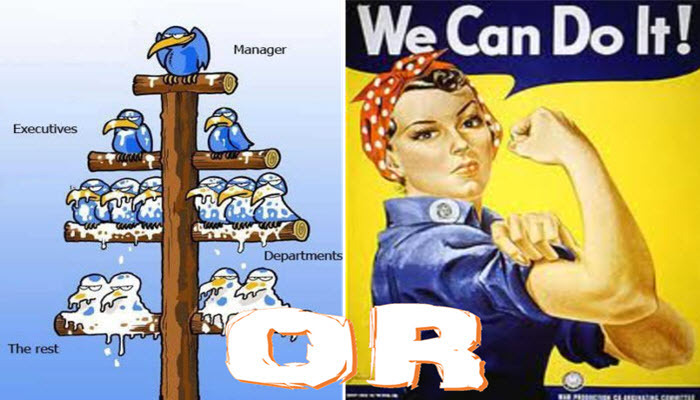 So the head of engineering realizes that he has some freedom within his department, but the other departments and the management have their own priorities. And PLM is not on their list. Together with the friendly CAD reseller, who meanwhile was promoted to be Senior PLM Consultant, they work on a perfect PLM environment within the engineering department and they believe their success will show off in the upcoming years. Conclusion: The silent PLM approach has a huge chance to fail as there is no corporate vision and management push to get PLM implemented. PLM should be addressed top-down. As in many mid-market companies there was also no strategically partner, who could assist the management to build a vision and to set priorities. Can chaos become order through PLM ? You might have heard about the chaos theory and the butterfly effect ? 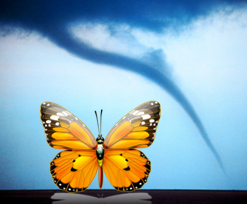 In general, the theory promoted by Edward Lorentz and others, claims that the flapping of the wings of a butterfly, somewhere in South America may influence ultimately the path of a tornado, either preventing or accelerating that a tornado may hit at a certain place in North America. WOW, if a butterfly can do this, can you imagine the impact of all of us, flapping our notes and plans around PLM in an organization ? What a chaos we can create ? I came to this association, looking back on my activities the past three weeks. Talking with implementers and companies, who all had a tornado of wishes and activities, trying to create order through a PLM implementation – the anti-chaos theory. Most of the discussions were based on a typical mid-market approach. What do I mean by a typical mid-market approach – and I am generalizing here. None of the people I have been talking to in the past weeks match the exact characteristics, however all contributed to the picture in my mind. (Power) User Driven / Do It yourself approach – inside the organization there are people who have the dream to improve the company with PDM / PLM and the energy to prove it. They build the plan and define the solutions. External resources are only hired to do specialized services, fitting in the thought process of the power users. They believe that everyone will see the benefits of the implementation and join their approach step-by-step enthusiastically. Focus on technical details– often the wishes are based on implementing technical capabilities close to the understanding of users, usually requiring a minimum of change in the daily processes. 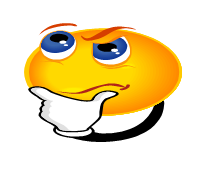 For example the focus might be on a technical capability how to connect the PLM system to the ERP system (Middleware / XML /Web Services / …..) instead of discussing how it will work from the process point of view – how is the process impacted ? Task solving – much in combination with the previous point, the focus is on optimizing and/or automating tasks of a certain user. The end-user’s daily tasks/pains are the focus for solving, which means trying to automate as much as possible, providing as much as possible single system / single screen solutions. Risk Avoidance – often these companies do not have the capabilities (people / time / budget) to experiment with new directions. Approaches from other similar companies are followed (looking for references). For sure not a bad approach, however the result is it will be harder to be differentiate from your competitors. And of course risk avoidance should always be considered in the scope of manageable risks. Focus on business skills – the people in the project team are often well educated in their daily business and practices, but lack project management, risk management and change management skills. These ‘soft’ skills are often acquired by buying a book to be placed on the desk. The power users should realize that they are sent on a difficult mission which requires a lot of creativity to implement changes in the context of the PLM project. 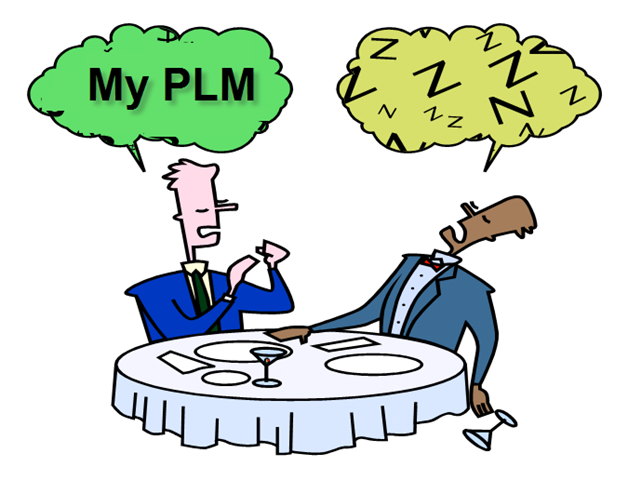 And strange as it seems the PLM software might not be the biggest challenge. The biggest challenge will be on choosing the right best practices and to implement them with acceptance of the users. This is change management combined with implementation knowledge / experience. They point for the power users should be to have an implementation partner with experience, who can explain why best practices work and explain how other companies address this issue. Without practical guidance the power users have become pioneers, which is something the management for sure wants to avoid. Often to avoid user objections, the project team decides on heavy customizations or ‘weird’ compromises – nice to keep the user community quiet, but bad for the future, as benefits will not be the same. This mainly happens as there is too much focus the ‘hard’ side of the project ( hardware /software /IT /Services ) , and no or limited attention to the human / change management side. Power Users – be aware ! The management should realize that it is a company’s decision and vision. So from their side a steering committee with a clear vision is required. Their job is to keep the vision, prioritize the activities and make sure the power users are not creating an isolated solution based on their dreams. The most important role of the management is to take continues responsibility for the project – it does not end by giving the approval for the project and budget. Where users might reluctantly accept changes, it is the job of the management to enforce the changes and support them. This can be done in a harsh way by imposing the changes, however this will cause resistance and the end users will demonstrate the management was wrong. This leads at the end to a situation where the company as a whole will be in a worse position as before. So managing by motivation should be the approach, as after all the power lies in motivated users, who understand the benefits of the changes and benefits for their future job. Management – be aware ! Make sure the focus and priority is on business not on IT. 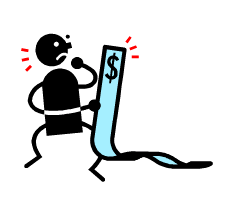 Sell and explain the business benefits internally all the time. There is significant management support and control needed to monitor, guide and sell the PLM project. To make sure the company benefits are targeted and not the individual users or departments demands only. 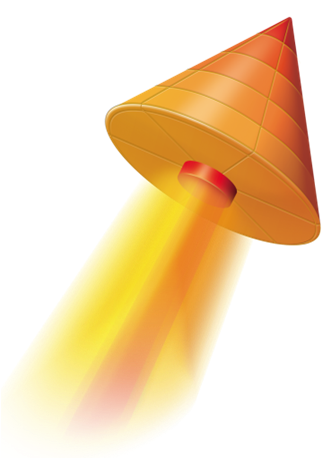 What not to do in a bottom-up PLM implementation ? The past month I was involved in a two ENOVIA SmarTeam projects, where both had the target to become the company’s PLM system. However the way these projects were executed lead to the conclusion that the first one was probably going to fail as a PLM system, were the second project was going to be successful. And only by looking back to the history of the first implementation, it became clear what prevented it from becoming implemented as a PLM system. It had all to do with a bottom-up approach and a top-down approach. I guess ENOVIA SmarTeam is one of the few products that allows a customer to make a choice between bottom-up or top-down. Somehow also Jim Brown’s post was in line with this observation, but judge yourself. Most classical PLM systems require a top-down approach as the PLM scope requires departments to work in a different way and to enforce a change on the organization. 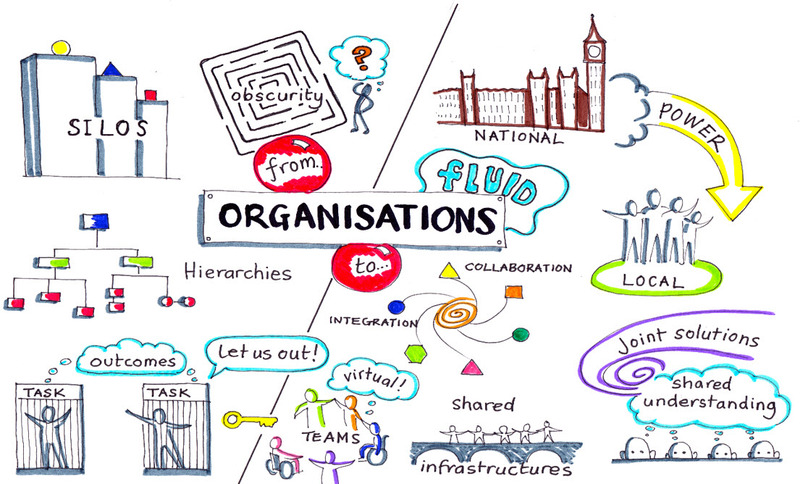 Organizational change usually only happens top-down based on the vision of the management. ENOVIA SmarTeam however has the option to be implemented as a CAD data management system, managing the Product Data in the form of documents. This brings a lot of value to the engineering department and depending on the PLM awareness of the company they might try to replace the Excel based Bill Of Materials into a BOM inside the system. As we are working in the scope of engineering this is in most of the cases the Engineering BOM. 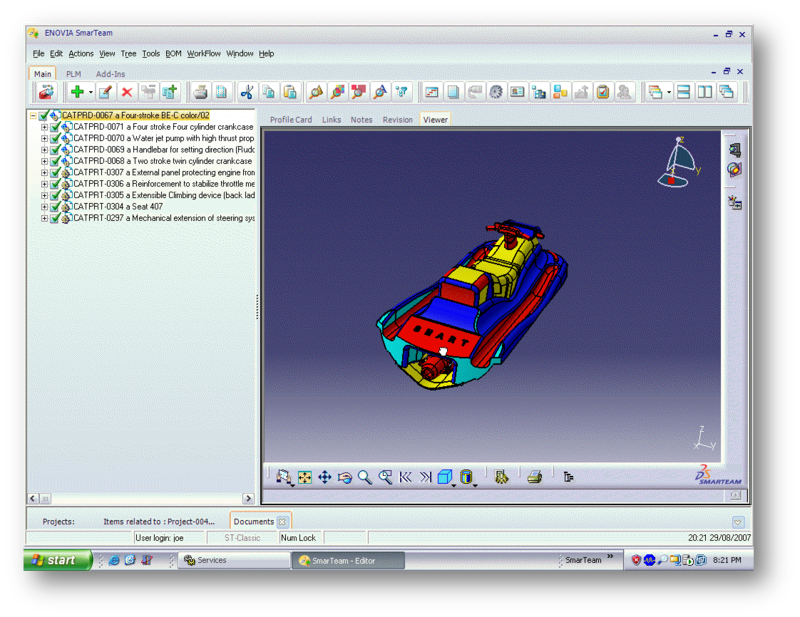 There are also other CAD data management systems that claim to be an enterprise PDM system as they manage the product data (usually only the native CAD data) and the engineering BOM. As these systems do not contain capabilities to become an enterprise PLM system, it will be clear for the organization, where to position it – and to keep it in the engineering department. …. and this did not happen. Why ? The main reason for that was that at the time the management had understood the PLM benefits and considered implementing PLM, they looked at SmarTeam and it was implemented too much as an engineering solution, too rich in functionality (and complexity) to be used and integrated by other departments. But when the company was looking to an PLM extension from their ERP system, the engineers refused to work with that system, as according to their opinion the system did not support their needs. How could this be prevented ? This was done exactly in the second project. Also here the implementation started in the engineering department, but from the start it was clear for the management, that they would extend the implementation towards a full cross-departmental PLM implementation. The main difference was that the implementation was not focused on satisfying the designers, but from the start it was clear ENOVIA SmarTeam should be useful for other departments too. This implicated less customization on the existing product, more standard functionality. Yes, the designer had to change their way of working as they worked file-based before. But as the focus of the implementation was always on providing data access across the organization, the system remained attractive for the production planning and manufacturing people. It was not an engineering tool only. Additionally the standard ENOVIA SmarTeam system required from all departments adaptations to their working methods, but as it was not heavily customized, it was much easier to extend the scope beyond engineering. Do not try to build the ultimate engineering solution as step 1 in a PLM project. Remain with the core capabilities. 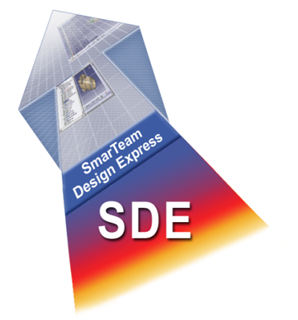 The ENOVIA SmarTeam Express offering allows a customer to start design centric (SDE = SmarTeam Design Express) and to extend the scope step by step by applying engineering capabilities extending the scope from Concept to Manufacturing (SNE = SmarTeam Engineering Express), guiding a bottom-up implementation step-by-step.